It’s right around the corner, so we automotive enthusiasts need to mentally prepare for the eventuality, SUVs from the 1990s will be seen as proper collectibles in just a few years. As a harbinger of things to come, this cherry XJ Jeep Cherokee is on Bring A Trailer right now, just begging for a huge bid to bring it home. It’s already up to $10,000 as of this writing, and could be poised for even more. It’s going to happen more and more, mark my words. Collectible cars gain value based on trends of demographics and nostalgia, obviously. The muscle car boom that happened twenty years ago was a result of that perfect storm, as well as the Porsche boom that we’re currently in the middle of. We are, most of us, guilty of lusting after cars we dreamed of and admired as children. For example, I had a Lamborghini LM002 poster on my wall, and I still have a major jones for one. As another example, my mother drove an S10 Blazer for much of my formative years, and I’d have another one today if I could. My wife’s first car was a beat up Ford Explorer, and she is frequently on Craigslist looking for another one. The best SUV of the era was, arguably, the XJ Cherokee. It took up the mantle where the Wagoneer began. 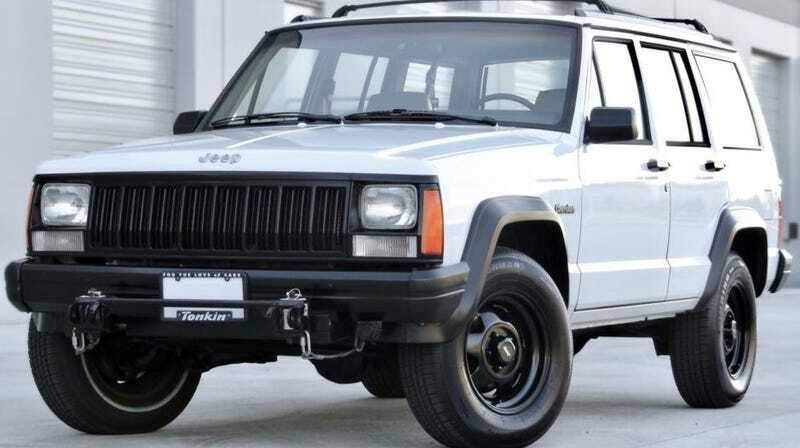 It was the first true daily driver SUV with most of the comfort and on-road character of a car with all of the off-road ability needed to be a proper Jeep. It was equal parts trail rated and mall rated. This generation of Jeep was admired by yuppies, soccer moms, stock brokers, and adventure off-roaders in equal measure. It was aspirational and attainable at the same time. We’ve already seen other icons of the era explode in value. BMW E30s are going sky high, Porsche 964s are already there, even C4-generation Corvettes are finally getting their due. For any car that can be seen as an icon of a generation, as the XJ definitely can, there will be thousands of people who remember them fondly. As millennials—I am one—have become professionals, have careers, and have lived a lifetime of nostalgia-worthy memories, we reach backward to our hero cars of time gone by. A cherry example of Jeep’s best family car is bound to attract attention from people like me, which is why I expect this ride to sell pretty high. Along with Ford O.J. Broncos, the aforementioned S10 Blazer, and FJ60 Land Cruisers, the XJ will be remembered fondly. Will that translate to people spending insane amounts of money for nice ones? It definitely will, and sooner than you might think. Check out the full listing with more photos and information on Bring A Trailer.